← Venice – amazing experience and now Croatia! Welcome to Croatia – or possibly not! Spoiler alert – the first part of this post is a bit of a rant. 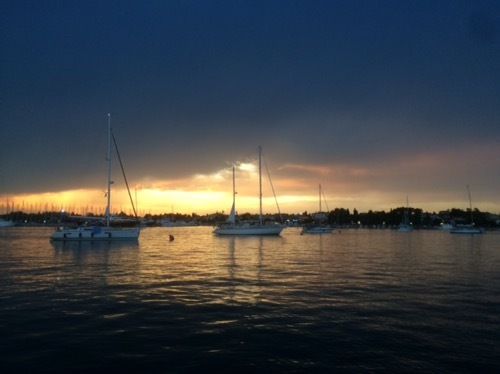 We left Venice Lagoon around midday and although we had to motor sail, we had a cracking journey over to Umag with an hour or two of actual sailing. Now, we had read that firstly, you now have to check out of Italy when crossing to Croatia as Croatia is not part of Schengen (like the UK). When we checked out of Italy at the police station in Venice, the very cute police officer said we had 24 hours to actually leave. Perfect. Secondly, when you enter Croatia, you must go to a port of entry which we did by coming into Umag. What anyone failed to tell us was that not only do you need to go directly to a port of entry but you also have to check in with the border police before doing anything else. We got there about 7.45pm and assumed that it was too late to check in so picked up a mooring buoy and started to cook dinner. About an hour later a police launch came by and asked for our papers. They then asked why we hadn’t checked in. My reply was that I had assumed they would be closed and that we would do it first thing in the morning. Apparently, they’re open 24 hours and you will be fined if you don’t check in immediately. So we left the mooring buoy and made our way to the customs quay to be told that we would be fined for breaking the law. As skipper, I took responsibility so managed to get a conviction within 5 mins of entering Croatia! Luckily, the police officer took pity on us and only fined us 1,000 kuna reduced to 666 kuna if we paid within 8 days. Liz was all for demanding where the regulations stated this urgency but I figured, just be nice. The fine could have been much bigger and they could have impounded the boat. Less than £100 seemed a bargain. They let us stay on the custom quay overnight as it was nearly 11pm by the time they had done all the necessary paperwork and I had agreed I was guilty as charged. It left a somewhat sour taste though. This morning, we were at the harbour master’s office at 8am so we could pay our fees and taxes for the next three months in the country and then went to a bank to pay the fine. All done by 9.30am so we slipped our mooring at 10 to make our way south. Not a great way to start our adventures in Croatia! However, we make good time today and it made a change to have other boats around us during the course of the day. 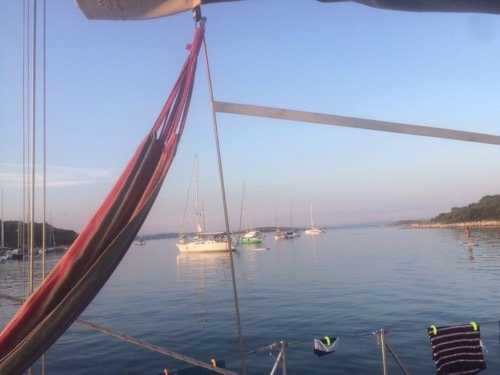 We are currently anchored in a bay just south of Pula, Istria. It’s a large anchorage with some 30 boats and room for 10 more. After a much needed swim, it is hammock time with a gin and tonic. The northern part of Croatia is supposed to be much quieter than the south so it could get interesting finding a space as we move down the coast.